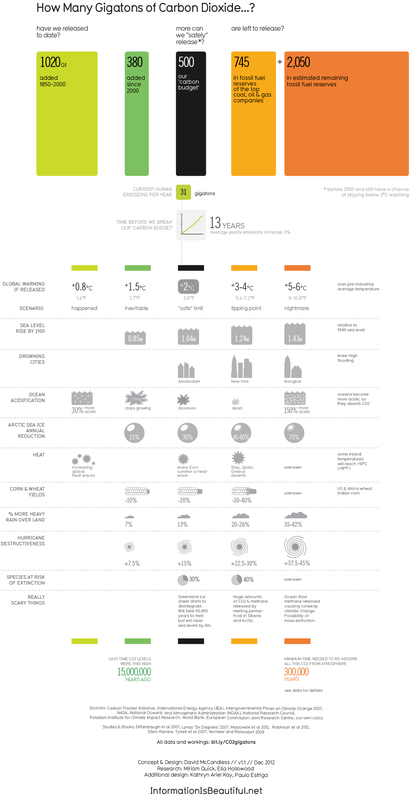 from Information is Beautiful: how much CO2 is there left? As I am a big follower of infographics, here is something new on carbon dioxide past & future and how the world will be affected by different levels of carbon dioxide released. Also, it is interesting as our current fossil fuels (coal, oil & gas) contained in the projects of top mining & petroleum producers seem to be taking the civilization across +3-4 degrees threshold. Looks like carbon storage needs to come to help if the predictions and carbon dioxide influence on global change are going to come true.